Digitalization of health care practices is substantially manifesting itself as an effective tool to diagnose and rectify complex cardiovascular abnormalities. For cardiovascular abnormalities, precise non-invasive imaging interventions are being used to develop patient specific diagnosis and surgical planning. Concurrently, pre surgical 3D simulation and computational modeling are aiding in the effective surgery and understanding of valve biomechanics, respectively. Consequently, 3D printing of patient specific valves that can mimic the original one will become an effective outbreak for valvular problems. Printing of these patient-specific tissues or organ components is becoming a viable option owing to the advances in biomaterials and additive manufacturing techniques. These additive manufacturing techniques are receiving a full-fledged support from burgeoning field of computational fluid dynamics, digital image processing, artificial intelligence, and continuum mechanics during their optimization and implementation. Further, studies at cellular and molecular biomechanics have enriched our understanding of biomechanical factors resulting in valvular heart diseases. Hence, the knowledge generated can guide us during the design and synthesis of biomaterials to develop superior extra cellular matrix, mimicking materials that can be used as a bioink for 3D printing of organs and tissues. With this notion, we have reviewed current opportunities and challenges in the diagnosis and treatment of heart valve abnormalities through patient-specific valve design via tissue engineering and 3D bioprinting. These valves can replace diseased valves by preserving homogeneity and individuality of the patients. Aortic regurgitation, aortic stenosis, primary mitral regurgitation, secondary mitral regurgitation, mitral stenosis, tricuspid regurgitation, tricuspid stenosis along with coronary artery disease, rheumatic fever and bacterial endocarditis are among the most dampen factors, which leads to the valvular heart diseases (VHDs) and valve abnormalities [1, 2]. The penultimate prophylaxis for VHDs is by identification of disorders at an early stage. It enables prevention of usage of available end stage diagnosis/treatment procedures, i.e. prosthetic valve replacement via transcatheterization or surgery . Besides, there also exist exclusive clinical guidelines issued by the eminent cardiologists concerning proactive steps for diagnosis and post/preoperative conditions at different stages along with the precise causes of these VHDs [4, 5]. These VHDs are associated with significant morbidity and mortality in an aged population, as they are correlated with vascular disorders. Considering the reasonable percentage of aged population in Europe, North America, Japan and other countries, VHDs are one of the prominent causes of death in these regions and need immediate attention . In VHDs, the valves become either too contracted to open-up entirely or incapable to close effectively. In such cases, the diseased valves drive the blood in a reverse direction (i.e. adjacent heart chamber) while an incompetent valve results in blood leakage into the chamber into which it previously exited . As a compensation for this inefficient pumping, the heart muscle enlarges and thickens, thereby losing its elasticity and morphology. These changes may result in hypoxic conditions leading to myocardial infarction, another fatal medical condition. Therefore, prosthetic valve replacement (via mechanical or biological valve) is the only exclusive solution available to compensate for the original valve under these rigorous circumstances . Nevertheless, this treatment entails some malfunctioning such as leaking, excessive care, medication and frequent clinical follow-up through imaging . Thus, it necessitates the search for an effective alternative such as patient-specific 3D printed, tissue-engineered valves using scaffolds and materials, which mimic the original valves [10, 11]. However, due to the limitations in scientific literature concerning the epidemiology, pathophysiology, mechanisms associated with regurgitation, stenosis and clinical management of VHDs, the development of alternative treatments for VHDs is quite challenging . Therefore, the quest for contemporary interventions of VHDs requires a multidisciplinary, holistic approach where the amalgamation of inputs from engineering, medicine and basic sciences can generate a better understanding of VHDs to develop improved, patient-complaint pre/postoperative treatment and prevention methodologies. Hence, this review provides various contemporary opportunities along with the associated challenges for cardiac interventions to combat against such medical conditions. It also discusses the advances in biomaterials with suitable fabrication techniques which hold a promise to present recent advances in vascularized constructs, myocardium and heart valve conduits. The evaluation of cardiac condition is a pre-requisite for elucidation of the extent of severity and the level of medical emergency. In case of VHD and related disorders, it can be diagnosed through any of two methods: first line of investigation includes non-invasive imaging modalities such as echocardiography, stress testing, cardiac magnetic resonance, computed tomography and cinefluoroscopy, while the latter is conducted through invasive imaging techniques comprising of cardiac catheterization (IOCT, IVUS) and coronary angiography [13–15]. These invasive techniques are more prone to initiate medical complications such as ventricular septal defect, coarctation of aorta, and many others. Therefore, it requires a higher expertise and skillful hands to perform invasive imaging. Moreover, there also lies the associated risks such bleeding, infection, clotting with an invasive modality due to the contact of the vascular layer with a foreign material and medications that might restricts the use of invasive techniques within their own sense of operations. Therefore, significant decision making parameters confirming the existence of VHD through non-invasive investigations is essential to study that are depicted in the Table 1. However, there exists certain clinical cases that deviates from the standard categorization, hence requires operator preparedness to modify the imaging prognosis to effectively define the lesion in a heart valve. Precautious modeling, 3D volume rendering (VR) and curved multiplanar reconstruction (CMPR) are among these that are practiced during the modified diagnosis strategy. VR and CMPR enable higher vessel visualization and helps in preparing for patient specific surgical planning and intervention. There also exits digital imaging modalities using flat panel detectors on a rotating arm around the patient to generate volume data set that can be used on the parallel workstation to cast real time 3D angiography or CT imaging . Integrated multidisciplinary approach for real-time 3D monitoring is shown in Fig. 1. Another intervention that provides near field and far-field imaging with minimal interference and devoid of anesthetic procedure is minimally invasive intracardiac echocardiography (ICE). The ICE utilizes the intracardiac ultrasound imaging catheter to perform its function. Depending on the specific clinical case requirements, the physician can easily manipulate the ICE setup to intervene and employ it for an effective diagnosis purpose . This radiation-free diagnosis can be a potential alternative to fluoroscopy imaging that exposes patients to the radiation. Provided the functionalities of ICE, Kenny et al., has discussed the commercially available ICE imaging techniques with their advantages and disadvantages . The data obtained from above imaging techniques is used to develop preoperative simulated model for the physician. These phantom models are used for training surgical procedure before actual operative practice. A case history of a 69 year old patient, having a compromised mitral valve-in-ring, suggested successful implementation of diagnostic imaging techniques to acquire data, develop a simulated model for visualization and a preoperative patient-specific 3D-printed phantom model to predict adequate clearance via simulation. Further, fruitful transcatheter mitral valve-in-ring (TMV-in-R) was substituted after gaining input from preoperative procedures. This procedure produced excellent clinical (proper functioning of mechanical valve) and hemodynamic results . Although it was clinical success, such interventions only provided a clinical tool to address the problem of stenosis or regurgitation. The underlying biomechanics of stenosis or regurgitation phenomena is least understood that might result in future complications like graft rejection, inflammation, delamination with nearby tissues and others. Therefore, mechanical interaction of blood and cardiac cells in such a mechanistic stressful environment of a valve need to be understood to ensure a successful integration of transplanted heart valve with a host tissue. Thus, these understandings are perquisite for the development of tissue-engineered valves and its effective remodeling and integration with native tissue without any physical abnormalities like changes in the mechanosensitive channels such as kinase due to hemodynamic pressure. Studies demonstrated that mechanical forces play a significant role in VHD by the active control of the function of a valve at a cellular level. The schematic of aortic valve in a transverse and longitudinal cross-section illustrate the type of mechanical forces acting on the different regions of heart valve during its functioning (Fig. 2). The valvular endothelial cells (VECs) and interstitial cells (VICs) are sensitive to mechanical forces and interact with each other through shear forces (oscillatory shear and laminar shear) experienced during blood flow . 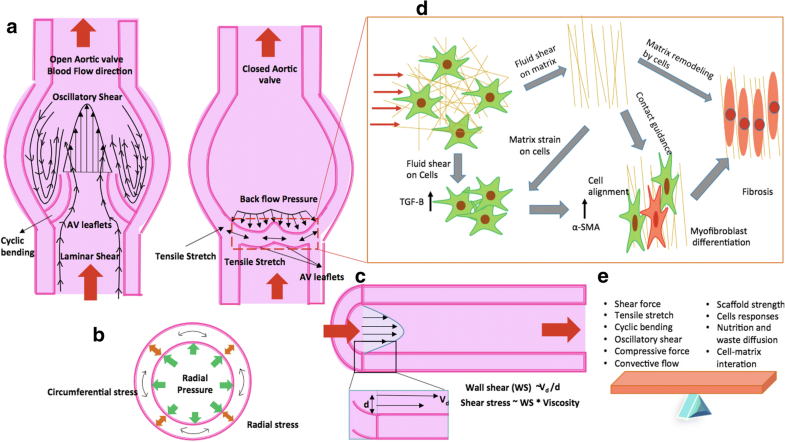 As the cyclic mechanical strain results in a tensile stretch in leaflets of heart valve during each stroke of pulsatile blood flow, this mechanical stimulus regulates the synthesis of glycosaminoglycans and proteoglycans by VECs and VICs. These biomolecules are instrumental extracellular matrix (ECM) remodeling in these tissues (Fig. 2a and d) . Moreover, NOTCH signaling in VECs and paracrine signaling pathways in VICs being highly sensitive to shear stress, plays an important role in valve homeostasis or disease development. Further, VECs is also known to regulate the VICs phenotype and ECM synthesis . It is likely that VECs experience differential shear stress at fibrosa-side of leaflets that increases the probability of rapid calcification for AVs. The changes in mechanical stresses result perturbation of the biosynthetic behavior of valve cells [23, 24]. The abnormal shear stress caused by ventricular infarctions in distinct regions, enhanced the collagen synthesis in the mitral valve leaflet that increases stiffness known as myxomatous remodeling . On the other hand, abnormal hemodynamics flow and shear stress causes valve leaflets inflammation, including fibrous layer that leads to stenosis calcification or calcific aortic valve disease (CAVD) followed by valve failure . Further, shear stresses up and down regulate the expression of proteins related to ECM, inflammation, osteogenesis and induced pluripotent stem cell (iPSC)-derived endothelial cells as described in Table 2. Furthermore, in the case of hypertension, valve cells experience high transvalvular pressures that lead to abnormal cyclic stretches, which increase the mechanical strains on the valve and accelerate the calcification . As the calcification increases, the effective area around the valve reduced which further enhance the transvalvular pressure gradient and develop a positive feedback loop. Moreover, these abnormal cyclic stretches activate VICs to over express α-SMA is resulting more contractility and stiffness especially in CAVD . Further, high pressure also up regulates and down regulates several cellular bio molecules that induces VECs alteration (Table 2), which ultimately remodel the ECM . Along with shear stress and pressure, AV also undergoes anisotropic strain on their leaflet. The out-flow side; exert comprehensive stress while inflow-side experiences tensile stress (Fig. 2a, b and c). The leaflet strain also regulates the expression of markers involved in ECM inflammation, osteogenesis and phenotype (Table 2) through inducing VECs and VICs . Moreover, recent studies also demonstrated the combined effect of different mechanical stresses in valvular pathophysiology. In this direction, Warnock and co-workers described the synergistic AV inflammatory response under combined cyclic strain and pressure than the individual response in the context of markers . Thus, a complete understanding of mechanobiology of stenosis provides an insight into valve pathophysiology. However, these studies are limited due to the limitation on our probing capacity of a diseased valve at both cellular/molecular length scale and investigate their biomechanical manifestation on the disease and physiology of valves at macroscopic scale. Therefore, a diseased model of stenosis created using imaging and multi-scale computational modeling can provide an enriched insight of mechanobiology of stenosis. Computational modeling and patient specific 3D simulations can be used to discover biological unfolds of VHD via assimilation of diverse data . To optimize therapeutic parameters, analysis of flow and its effect on the four heart valves taking into account the patient anatomy, physiology and genetic information has been investigated using CFD . However, the most significant parameters reviewed in this field are the relative high stresses with reference to geometric, microstructures, nonlinear and anisotropic constitutive behavior, loading conditions, along with kinematic constraint functions for the intervention of aortic and mitral valve abnormalities. Moreover, biophysical parameters with prevalent myocardial stiffness and contractility can be estimated by optimal matching of the behavior of these models to the data obtained from medical imaging. Thus, this integration provides new information on mechanisms of compensated and decompensated adaptation using less-invasive techniques . Human heart simulator is formulated for the spatiotemporal evolution of electrical potentials and mechanical deformation across the heart using two-field finite element approach and Windkessel model . It is used to probe landscapes of clinical parameters and guide device design for treatment planning in VHD. Based on this human heart simulator, an annuloplasty ring is designed that included a sub-valvular element to correct the valve dysfunction. This designing enables simulations of normal cardiac function as well as pathologic function in the setting of the posterior left ventricular papillary muscle infarction . In another procedure, in vitro left heart simulator is used on which mitral valves were mounted and tested under pulsatile blood flow. This procedure quantifies anterior leaflet strain, leaflet coaptation length, depth, tenting area and regurgitation volume in the radial and circumferential directions at an increased level of geometric distortion . The data generated from such studies provide a platform for the development of future surgical planning via computational modeling. Replacing heart valves made-up from biologically derived materials is a holy grail of tissue engineering and these valves are referred to as bioprosthetic heart valves (BHVs). Although these valves have material and blood flow characteristics similar to the native valves, their failure continues to result from leaflet structural deterioration, mediated by fatigue or tissue mineralization. Therefore, to predict and optimize the distribution of stresses, tools from engineering are quite useful. The computational modeling through multi-scale mechanobiology under dynamic conditions was explored by Emmert et al., 2018 to determine the factors affecting the tissue remodeling by the seeded cells. Thus, knowledge gained was utilized to optimize the design of the tissue engineered heart valves (TEHVs). They demonstrated that computationally inspired design of TEHVs was better in tissue remodeling in sheep model . Thus, these tools including quasi-static mechanics, dynamic structural mechanics, and more recently, fluid–structure interaction (FSI) can potentially provide better understanding of biomechanics of heart valve . Immersogeometric FSI analysis is performed to parameterize the leaflet geometry using key design parameters (such as effective orifice area and the co-adaptation area) that is compared with patient-specific MRI data to demonstrate the qualitative similarity of the flow patterns in the ascending aorta. The imaging techniques combined with computational mechanics modeling have the potential to accelerate the design and development of bioprosthetic heart valves (BHVs). However, currently, clinicians opt for commercially available heart valves for their patients as TEHVs are currently in R&D stage. It is necessary to select an artificial heart valve from the pool of commercially available heart valves that demonstrates high matching scores when compared with the models generated from patient data. In spite of such meticulous selection of heart valves, they suffer from regurgitation or stenosis, poor integration with host tissue, sometime immunological reactions and others. Moreover, there are hardly any alternative treatment modalities for fixing the partial defects or functional abnormalities in the native valves except the whole heart valve replacement. This unnecessarily increases the mortality and morbidity for patients. Henceforth advancements in imaging, computational modeling and designing tools need to be integrated with emerging areas of tissue engineering in order to develop human prosthesis similar to native tissues. Tissue engineering holds the potential to reduce patient–prosthesis mismatch in the direction of personalized medicine and accelerate the design and developmental time of prosthetic devices . Creating a construct of heart valve through tissue engineering principles can solve two purposes; first, the design and development of a bioartifical heart valve mimicking the structural and the functional aspect of a native valve that can be used as an implantable device and second, the generation of a disease model of a heart valve that can be used to generate understanding about the mechanobiology of the tissue and hence, assist in understanding a disease progressing, developing effecting therapeutic interventions. Before tissue engineering a heart valve, it is imperative to understand the multi-scale architecture, geometry and biomechanics of a heart valve’s parts that play a significant role in remodeling of a neo tissue matrix in the dynamic mechanical environment of a functional heart valve. These understandings will enable proper selection of biomaterials, fabrication methodologies, characterization tools and developmental environments for generation of tissue engineered heart valves (TEHVs). The anatomy of the valves reveals that they are 3D structures experiencing a periodic physiological pressure of blood while entry and exit from a heart. The two major components of a heart valves are leaflets and root . The leaflets are trilayer structures (fibrosa, spongiosa, and ventricularis) that continuously flaps, resulting in a closure and opening of a valve, experiences shear stress and periodic loading and unloading while the roots are annular structure whose one end provides support to the leaflet and its other end serves as a base to be integrated with the major blood vessels of a heart. Further, endothelial, smooth muscle, fibroblast and interstitial cells populate these valves in a defined spatial location having different flexure strength and stiffness. Provided the anisotropy in the mechanical and structural requirement and heterogeneity of cell types distribution, different biomaterials are needed to be used for the generation of different structures of a 3D heart valve having compatible biomechanical properties . Further, the interface has to be a strong enough to prevent a damage at the inter junction of a leaf and a root. Tissue engineering of heart valve through decellularised heart valves obtained from xenogenic or allogenic sources has been one of the best approaches . The scaffolding results in an optimal micro environment for cells. However, this decellularization is achieved through several chemical and enzymatic treatments that weaken the scaffold, making it hostile to be further developed in a bioreactor . Further, it also poses antigenic immunological reaction at the site of graft in patients. Therefore, usage of synthetic biomaterial for scaffold development has gained importance in recent years. The use of materials like polyhydroxyalkanoates, polyhydroxyoctanoates, polyglycolic acid, polylactic acid, chitosan, collagen, polyglycerolsebacatehas been used to create a porous scaffold mimicking the morphology and geometry of heart-valve through different microfabrication techniques like electrospinning, salt-leaching, hydrogels, cryogels and others [42–45]. These fibrous, porous scaffolds mimic the ECM, thereby provides adequate mechanical and topological cues for adhesion, migration, growth, differentiation and proliferation of cells. In addition, the porous structure also enabled easy exchange of nutrients and oxygen to the seeded cells and removal of metabolic waste from them . In spite of such advantages, it has been observed that precursor cells from heart or blood enter in the porous scaffold during an implant and exhibits traits of thrombosis, contraction, osteogenic phenotype, mineralization, a hallmark of non-conducive micro environment for cells . The design of these scaffolds severely limits the neo tissue remodeling by the seeded cells. The seeded valve cells either result in a thickened stenotic valve or hyper contracted valve that fails to close properly. This might be due to an inherent limitation of above methods to fabricate scaffolds with mechanical heterogeneity and asymmetry and provide mechanical cues with spatial variation. Further, it is challenging to create a monolithic, complete, complex geometry of heart-valve through the above methods, except its individual parts i.e. leaf, roots and others. In addition, achieving mechanical properties commensurate with spatial location is still a bottleneck with above fabrication methods. Therefore 3D printing/bioprinting has been explored for the heart-valve generation. There are several 3D printing technologies that have a potential for create complex heart valve structures. The extrusion based 3D printing technologies uses either organic solvent or heat to create polymer solution or melt for generating 3D structures. Hence, they are hardly suitable for any live cell incorporation during printing except creating a 3D solid scaffold for seeding different cell types of a heart valve. The particle fusion based 3D printing is practiced either by bonding ceramic microparticles with any bioglue or by sintering metallic particles with high energy laser beam . The ceramic based 3D printing may support the cells incorporation but its mechanical properties may not be in congruence with a natural heart valve. Further, the degradation product of ceramic creates acidic environment that is hostile for heart valve cells in a long run [48, 49]. The 3D printing based on metallic sintering is not suitable for heart value due incompatible mechanical properties and thermal pre and post processing. Similarly, SLA based 3D printing is limited due harsh nature of UV cross-linking, extensive post-processing and lack of biocompatible and biodegradable materials acceptable in SLA. Therefore, inkjet printing and bioprinting are the 3D printing technologies that utilizes cell laden droplet bioinks or hydrogels for 3D printing of tissues and cells [50–52]. The heart of any bioprinting technique is a bioink, a gel material capable of being printed in a 3D architecture defined by a CAD model . These CAD are either modeled through processing of CT, MRI images by volume rendering and modeling techniques (Fig. 3) or through computationally inspired designed as described by Emmert et al., 2018 . The several hydrogels have gained popularity as a bio-ink, listed in the Table 3 [54–56]. The biomaterials like synthetic polymers (e.g., PEG, PEGDA), natural polymers (e.g.hyaluronic acid) and protein materials (e.g., fibrin, collagen, and glycosaminoglycans) are the best sources to produce hydrogels . Further, the strength of the hydrogels can be tailored by variation in the cross-linking among the polymer chains. This can be achieved well by changes in the UV exposure time, cross linker density, temperature and others during the fabrication process. 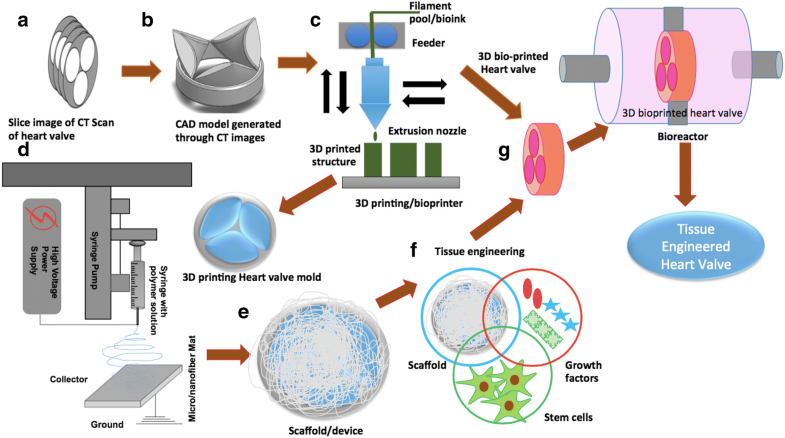 Moreover, 3D bioprinting also facilitates seeding different cell types at different spatial locations mimicking heart valve tissue during 3D bioprinting . However, considering the regional and spatial mechanical heterogeneity of a heart valve, it is still a challenge to achieve completely controlled regional and spatial cross-linking in 3D printed hydrogels. The changes in the mechanical properties of gel must be carried out without affecting the physiological behavior of the different types of seeded cells (Table 3) in the spatially different regions of the heart valve. For example, excessive UV exposure or cross linker may be toxic to cells, excessive mechanical strength in the gel may lead to different phenotypic expression by cells and lower strength will make the device hostile to be further used in bioreactors [55, 57]. The increase in the thickness of the 3D bioprinted tissue poses a serious limitation on the transport of gases, nutrients and waste to and from the cells residing in the core of the 3D printed tissue. This results in a hypoxic and nutrient deficient center. Thus, there is need for the development of vascularization during the fabrication process. Moreover, bioprinting of composites of electrospun nanofibers and hydrogels can be a used for localized enhancement of mechanical strength. This will not only maintain the mechanical integrity of the scaffold but also provide mechanical cues necessary for precursor cells to differentiate into VICs, VECs and other cell types during static/dynamic cell culture. However, there has to be a balance between the amount of polymers and cells, such that polymers can provide enough mechanical strength to the scaffold while cell grows happily during tissue development and remodeling. We propose a combination of different fabrication technologies discussed above to arrive at scaffolds having spatial mechanical heterogeneity, 3D multiscale architecture and physiochemical characteristics that can facilitate appropriate growth, development and remodeling attributes of resident valve cells. These developed scaffolds can be further developed by providing biomechanical stimulus in perfusion bioreactors (Fig. 3). Achieving regional and spatial heterogeneity in the mechanical properties in complex 3D architecture might be a daunting task; however, it is relatively feasible to achieve regional heterogeneity in mechanical properties in a planner device made up of biocompatible hydrogels. 4D printing has allowed the researchers to codify different mechanical stiffness at different locations in planner object made up of stimuli responsive materials . The heterogeneity in the Young’s modulus of hydrogels can be achieved through the introduction of fibrils during printing in a planar device. Due to the variation in stiffness of the materials and its swelling behavior, these modified hydrogels get folded in 3D architecture on exposure to biofluids . Thus stimuli responsive biomaterials can be printed and folded in 3D complex geometries upon stimulation with the appropriate environment. 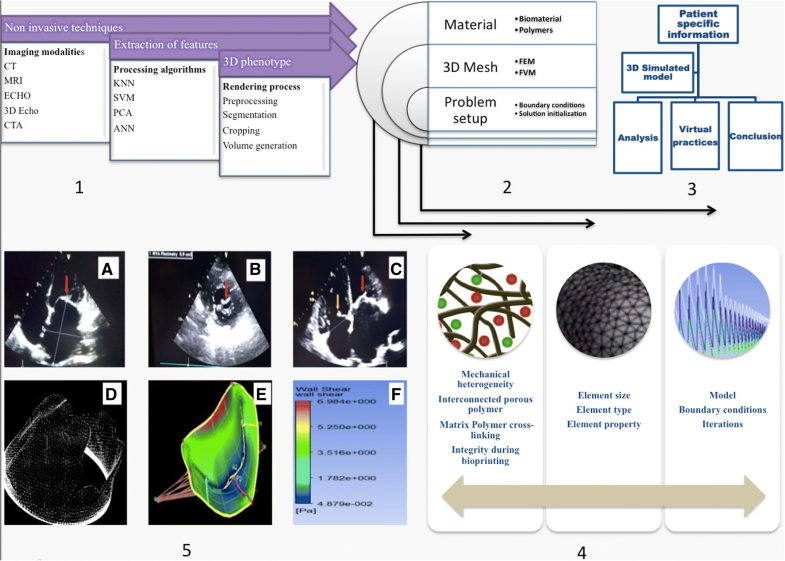 Thus, there exist possibilities to develop heart-valve through origami inspired folding of planner biomaterial into complex 3D heart valve geometry having appropriate spatial mechanical properties. Although, none of the tissue engineering approaches till now have been successful in generating fully functional heart valve, they have their own advantages and disadvantages in heart valve regeneration as listed in the Table 4. We believe that novel biomaterials supporting spatio-temporal control over the mechanical properties during 3D bioprinting can lead to a development of patient specific bio artificial heart valves. The underlying motivation to investigate patient-specific valve printing via tissue engineering and 3D bioprinting is to find significant causes and conclude measures to eradicate potential defects in prosthetic heart valves. In this review, we attempted to describe the possible engineering tools and techniques for better diagnosis of stenosis, understand the underlying biomechanics at a different length scale, proper treatment planning and practices and finally the potential pitfalls of the current clinical interventions. We has also discussed the role of futuristic technologies like bioprinting and 4D printing along with the possible biomaterials to develop bioprosthetic valves --- a step closer to personalized medicine. Moreover, some recent research undertakings signifying the use of 3D printing and scaffolds towards VHDs engineering is shown in the Table 5. Although this state of art is currently limited in its performance, nevertheless we propose a formal set of notion to overcome it. 3D-bioprinted CAVD model is engineered and layer-specific mechanical properties of the human AV was studied. Valsalva grafts deform the radial position of the aortic valve. It results in an impaired leaflet motion, higher stresses, and potentially reduced valve performance compared to straight tubular grafts. Pre-implant modeling that assumes a rigid vessel quite accurately predicts the degree of distal RVOT expansion following an actual device replacement. It represents case study of 3D printed models using preoperative computed tomography or MRI in pediatric and adult cardiac surgery. Authors acknowledge M.D. University Rohtak, India for providing infrastructural facilities. RV acknowledges the financial support in the form of M. Tech Fellowship by MHRD, Government of India. PS acknowledges Department of Microbiology, Barkatullah University, Bhopal, India for their infrastructural support for D.Sc. Work. This review has cited the relevant references as necessary. All authors have contributed to the manuscript. PS, PK contributed to the editing of the manuscript. All authors read and approved the final version. This review article does not contain any studies with human participants or animals performed by any of the authors. This review paper does not contain any individual’s personal data in any form. The authors declare that they have no coempeting interests. Chia HN, Wu BM. Recent advances in 3D printing of biomaterials. J Biol Eng. 9 4. 1 Mar. 2015. https://doi.org/10.1186/s13036-015-0001-4.